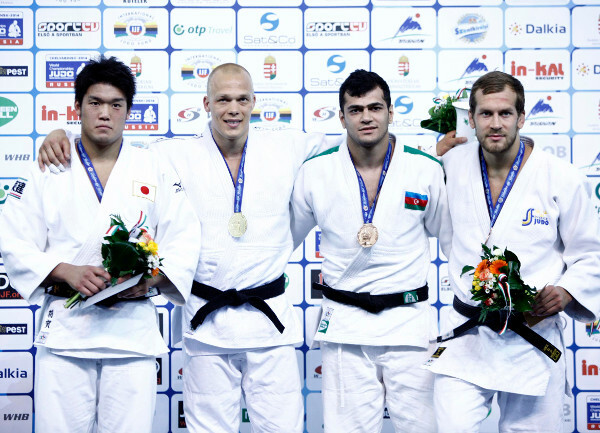 The Judo Grand Prix, Budapest 2014, concluded with the second and final day at the Papp Laszlo Sport Arena on Sunday. The Hungarian fans were in great voice as they saw seven weight categories fighting on the tatami in search of Grand Prix silverware. The women’s -70kg, -78kg and +78kg categories and men’s -81kg, -90kg, -100kg and +100kg categories were all in action including the hosts’ heavyweight elite. 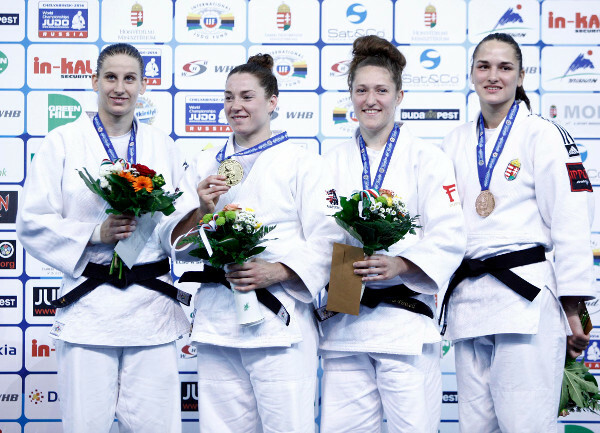 Budapest was the successful stage for Hungary’s first Grand Prix which attracted an impressive 405 judoka and 53 countries. The two-day event was the second IJF event to carry points towards qualification to the Rio 2016 Olympic Games following the Havana Grand Prix which took place a fortnight ago. Ahead of the final block there was a contract signing between the IJF and IBSA (International Blind Sports Federation) to initiate a collaboration between the federations and their respective governing of fully sighted and visually impaired judo. Mr. Marius VIZER, IJF President, said: “After 56 years, the Hungarian sports landscape has now organised a great event which has international fame. Of course we are talking a lot about the Olympic qualification and it is the most important thing for the athletes but it’s also important to have the vision of sport development. Most of the opinions consider this Grand Prix as one of the most successful first editions. This city will be a candidate for the 2017 World Judo Championships. Dr. TOTH said: “We have been working together with Mr. Vizer for more than 10 years and both technically and tactically, we have a long term vision here in Budapest and this a great illustration of that vision. I am very happy to report to you that the Hungarian Government is very satisfied with the results obtained by our athletes and organisers and will strongly support the federation in the upcoming years. “When we had to present our development programme to the government it was easy and hard at the same time. But generally speaking it was easy because we stick to the IJF programme. The aim is the highest level of sport development as an Olympic sport and the Hungarian Judo Association’s plan is to add a further 20,000 judoka. “This Grand Prix gave great opportunity to thousands of young people to get closer and closer to what judo is. 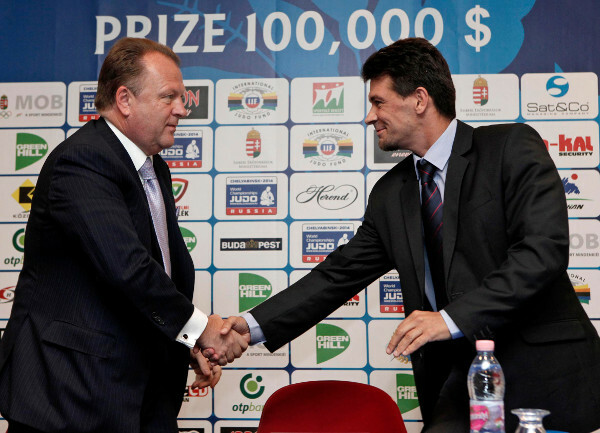 This September, a special school programme will start in Hungary with the support of Mr. VIZER. In the near future we also want to establish an Olympic centre here in Budapest. It should become real in September. 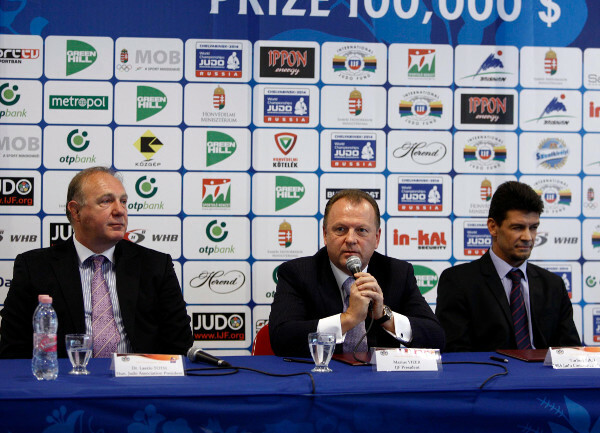 Mr. Norbert BIRO, IBSA Judo Committee Chairman, said: “This day is a turning point in the history of IBSA. It is very necessary to have a close cooperation with the international federation for the development of sports. Japan topped the medal table with six gold, one silver and two bronze as only heavyweight KAMIKAWA Daiki (JPN) missed on a medal from their 10-strong team. The 2014 IJF World Judo Tour reconvenes in Mongolia’s capital city of Ulaanbaatar for the country’s second Grand Prix from 4-6 July. 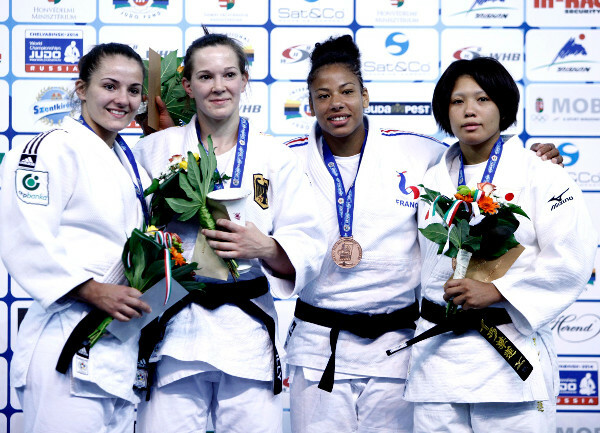 Rijeka Grand Prix bronze medallist Iljana MARZOK (GER) reigned in the -70kg category as she won her final against Havana Grand Prix bronze medallist Barbara MATIC (CRO). MARZOK has been battling niggling injuries but looked fully fit and full of energy as she returned with a high-quality performance. 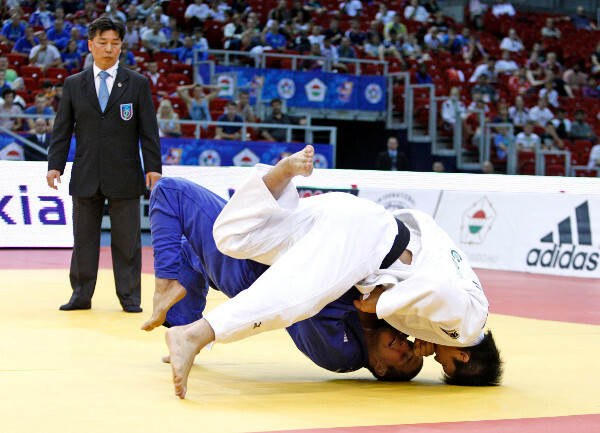 The German judoka defeated teenager star MATIC by ippon from an ouchi-gari after just 36 seconds. In the first semi-final MARZOK bested World Championships-bound NUNIRA Karen (JPN) by trapping her with sankaku-gatame for 20 seconds to earn ippon. At the same stage MATIC defeated Paris Grand Slam silver medallist Fanny Estelle POSVITE (FRA) with two waza-ari scores. The first bronze medal was won by world number 12 POSVITE who proved too strong for Qingdao Grand Prix winner CHEN Fei (CHN) as she was dispatched by ippon with two minutes remaining. 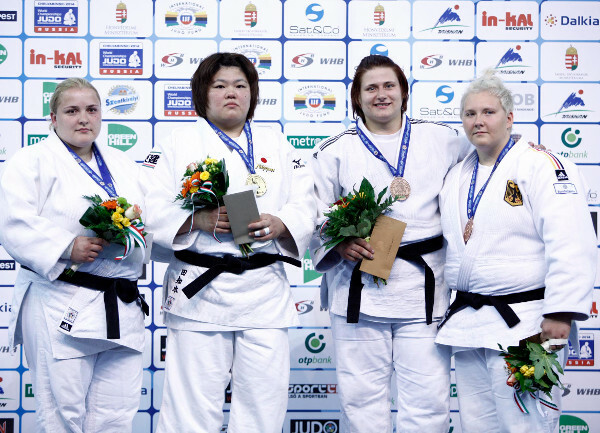 The second bronze medal went to NUNIRA who defeated 21-year-old Warsaw European Open silver medallist Szaundra DIEDRICH (GER) vs NUNIRA, Karen (JPN) by a yuko from a harai-goshi. European silver medallist Marhinde VERKERK (NED) ousted world number three Anamari VELENSEK (SLO) in the -78kg final. World number two VERKERK was the busier of the two rivals as she received one shido penalty for passivity while VELENSEK received three shido penalties for passivity in a frustrating final. In the first semi-final VERKERK thwarted Samsun Grand Prix silver medallist Natalie POWELL (GBR) by a waza-ari score while at the same stage VELENSEK defeated European bronze medallist Abigel JOO (HUN) by ippon after 90 seconds. The first bronze medal was won by JOO who earned a huge ovation from the teeming home crowd as she held off Lucie LOUETTE KANNING (FRA). JOO was penalised for an overly defensive grip and passivity while Frenchwoman LOUETTE KANNING was penalised three times for passivity, an overly defensive grip and again for passivity. The second bronze medal went losing semi-finalist POWELL who confidently and comprehensively prevailed against Ivana MARANIC (CRO). POWELL scored a waza-ari from a harai-makikomi and added a second from osaekomi-waza. 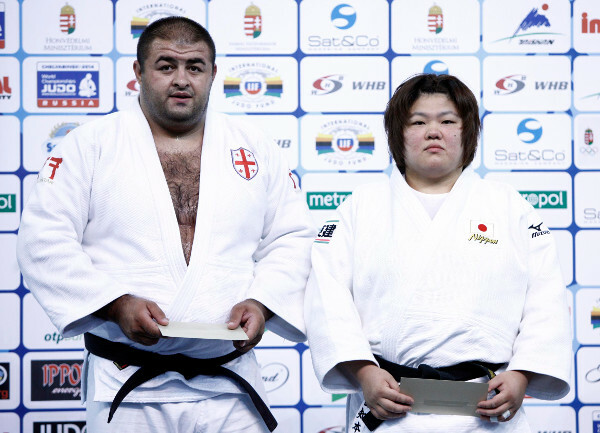 Three-time world bronze medallist TACHIMOTO Megumi (JPN) was victorious against Svitlana IAROMKA (UKR) in the women’s heavyweight final on Sunday. 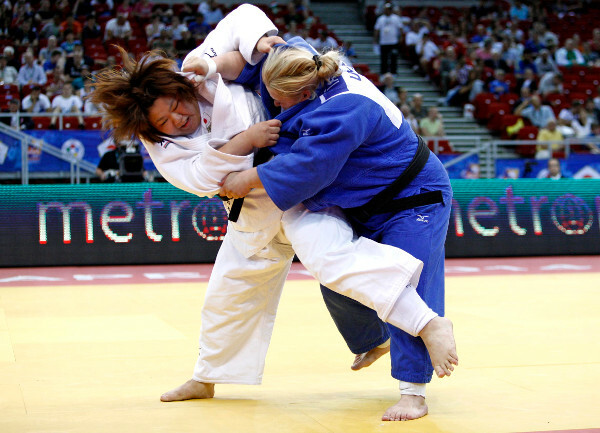 TACHIMOTO saw her opponent receive a shido for passivity and, when the moment presented itself, powered into action to throw with a harai-goshi for ippon after two minutes. In the first semi-final TACHIMOTO defeated former European bronze medallist Iryna KINDZERSKA (UKR) by scoring a waza-ari and then a second from trapping her opponent in a kami-shiho-gatame for 15 seconds. In the second semi-final IAROMKA booked her place in the final by conquering European runner-up Larisa CERIC (BIH) by ippon after two minutes of action. The first bronze medal was won by CERIC (BIH) who submitted Maryna SLUTSKAYA (BLR) with a koshi-jime strangle after 80 seconds. The second bronze medal was won by European bronze medallist Jasmin KUELBS (GER) who inflicted a second defeat in a row for KINDZERSKA. KUELBS took the lead with a waza-ari from ashi-waza and controlled her opponent on the ground to trap her in a kuzure-kesa-gatame for 15 seconds to win by wazari-awasette-ippon. Russian youngster Khasan KHALMURZAEV (RUS) won an all-Russian -81kg final as two-time World Judo Masters bronze medallist Sirazhudin MAGOMEDOV (RUS) lost out. KHALMURZAEV and MAGOMEDOV traded shido penalties for passivity as both men lacked purpose before the former tapped out his more experienced teammate with a juji-gatame. In the first semi-final MAGOMEDOV denied the hosts a finalist as Laszlo CSOKNYAI (HUN) fell by a buzzer-beating waza-ari while at the same stage KHALMURZAEV defeated world bronze medallist Alain SCHMITT (FRA) on shido penalties. The first bronze medal was won by Frenchman SCHMITT who swept past Szabolcs KRIZSAN (HUN) by ippon after two minutes. The second bronze medal went to Roman MOUSTOPOULOS (GRE) as Hungary suffered another near miss when Laszlo CSOKNYAI (HUN) scored a yuko in the last second from a determined uchi-mata effort. Double world silver medallist NISHIYAMA Daiki after defeating home fighter TOTH Krisztian (HUN) in the -90kg final by a waza-ari score. European bronze medallist TOTH, 20, is an exciting talent on the rise and claimed the first Grand Prix medal of his burgeoning career. In the first semi-final NISHIYAMA defeated Milan RANDL (SVK) on shido penalties with two against the Japanese judoka and three against the Slovakian. In the second semi-final TOTH beat veteran Guillaume ELMONT (NED) by holding him down for 20 seconds for ippon. The first bronze medal was won by Noel VAN T END (NED) his teammate Guillaume ELMONT (NED) was unable to compete due to injury. The second bronze medal was won by Khusen KHALMURZAEV (RUS) who triumphed against losing semi-finailst RANDL by ippon from a harai-goshi with 17 seconds left. Paris Grand Slam bronze medallist Henk GROL (NED) was the only man able to stop HAGA Ryunosuke (JPN) on Sunday as he scored ippon with two minutes remaining from a tani-otoshi. GROL defeated the 23-year-old and raised his hands in the air as he continued to build momentum towards the World Championships having finished second last year in Rio. In the first semi-final HAGA defeated Martin PACEK (SWE) by ippon after leading with a waza-ari. At the same stage GROL dispatched Elmar GASIMOV (AZE) by a solitary waza-ari which was the only score of the contest. The first bronze medal was won by GASIMOV who was victorious against Artem BLOSHENKO (UKR) from yuko score while both judoka had three shido penalties and narrowly escaped disqualification which would have happened if a fourth penalty was given to either fighter. 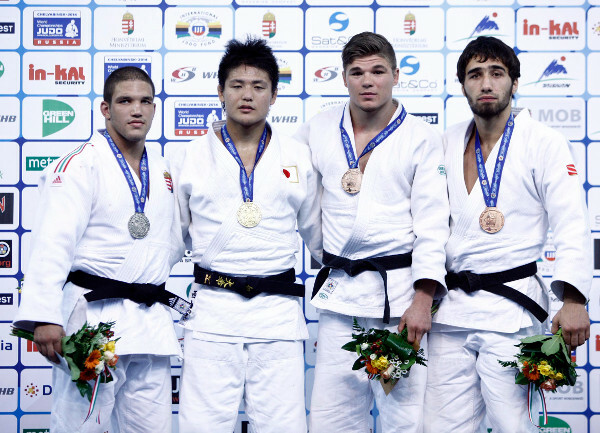 The second bronze medal went to PACEK who defeated Jevgenijs BORODAVKO (LAT) by scoring a yuko from a ouchi-gari. The Swede went back to the same technique to produce the same score with 12 seconds remaining. 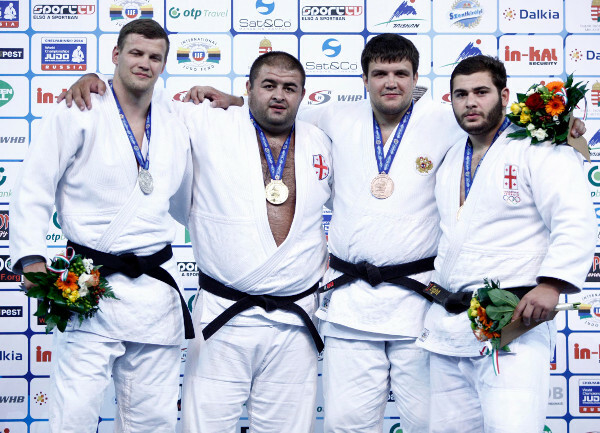 European silver medallist Adam OKRUASHVILI (GEO) topped the heavyweight men’s field in Budapest as he halted the run of Marius PASKEVICIUS (LTU) in the +100kg final. OKRUASHVILI scored a waza-ari from a yoko-shiho-gatame and that was decisive after five minutes as the Georgian claimed the final gold medal of the inaugural Budapest Grand Prix. In the first semi-final OKRUASHVILI defeated Havana Grand Prix bronze medallist Barna BOR (HUN) by ippon after three minutes of action to the dissatisfaction of the home fans. In the second semi-final PASKEVICIUS outgunned former Baku Grand Slam bronze medallist Andrey VOLKOV (RUS) by a waza-ari score. The first bronze medal was won by VOLKOV who returned to winning ways at the expense of Madrid European Open winner Stanislav BONDARENKO (UKR) who had a yuko advantage after five minutes having previously scored a waza-ari. 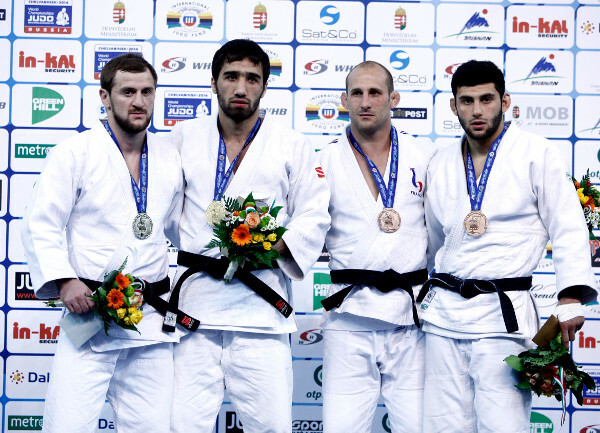 The second bronze medal went to Samsun Grand Prix bronze medallist Levani MATIASHVILI (GEO) who defeated BOR with a huge harai-makikomi for ippon which won the applause of the home fans.